Originally created by the talented Glen Larson, Battlestar Galactica aired on television from 1978-1980. The U.S. premier episode drew some 65 million viewers (source: wikipedia.org). “Fleeing from the Cylon Tyranny the last Battlestar, Galactica, leads a rag-tag fugitive fleet on a lonely quest to a shining planet, known as Earth!" 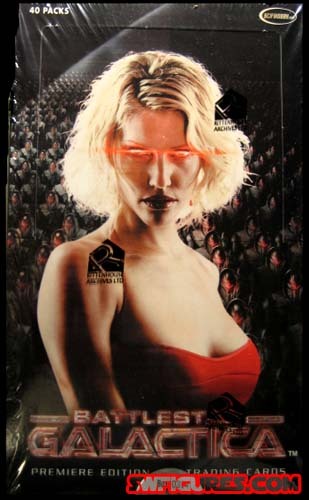 Battlestar Galactica found its way back to television starting in 2004 with a new hit cast and ratings to boot! Read more history from the original hit TV show. Listen and watch FREE: YouTube® Battlestar Galactica (1978) introduction feed. Listen and watch FREE: YouTube® Battlestar Galactica (2004) introduction feed. 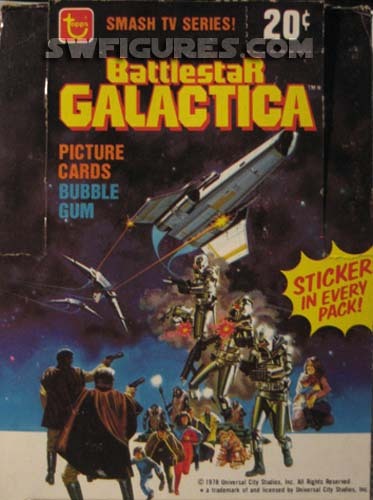 From the original hit 1978 movie and TV series, Battlestar Galactica, vynyl wallet and official ID card, blister sealed on card from our factory 1978 case! Made in Hong Kong. 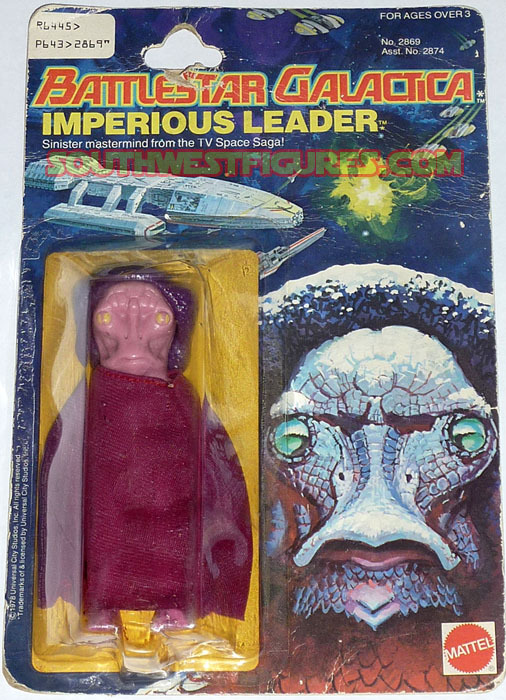 From the original hit 1978 movie and TV series, Battlestar Galactica, this features the Imperious Leader on 3 3/4" standard sized action figure on non-mint card due to age and wear. Figure still sealed on card. 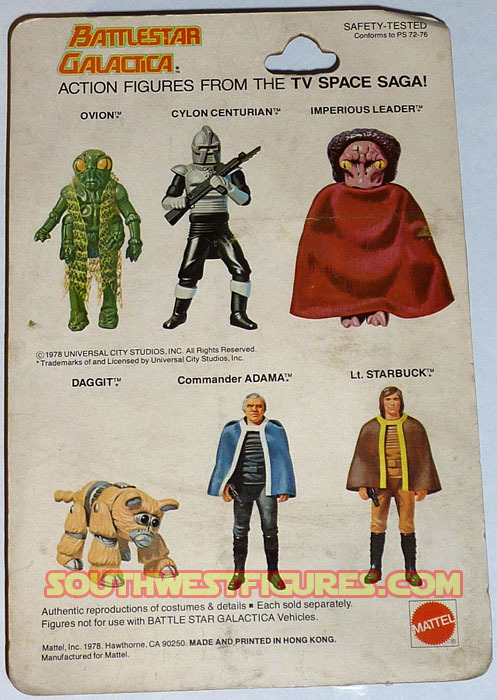 Becoming rare item, an original 2005 factory box (complete) is the first series trading cards from the new Battlestar Galactica TV Series. Box contains contains 40 packs. Each pack includes 5 cards, (200 cards total). Look for randomly inserted Roll Call Cards (1:10 packs), Cylon Threat Cards (1:20 packs), Costume Cards (1:40 packs), Quotable Battlestar Galactica Cards (1:40 packs), and Autograph Cards (1:40 packs - Manufacturer states, "each box will contain 1 Autograph Card and 1 Costume Card!" "There are many copies..." but only 6,000 of this premiere edition. Factory sold out. Currently, only one in stock. Manufactured by Rittenhouse. 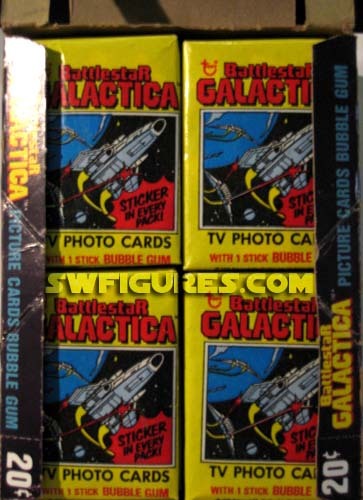 From the original hit TV series, this Battlestar Galactica features an original Topps factory box (complete). Contains: 36 wax packs. Each pack includes 10 cards, 1 sticker, (396 items total), plus 1 stick of gum per pack. Despite its miraculous ability to survive consistency, please do not eat the gum.